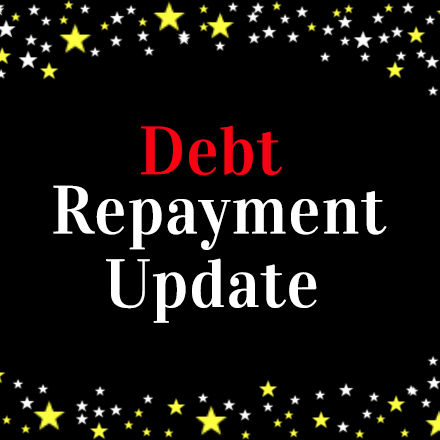 Welcome to my debt repayment and extra income update from June! 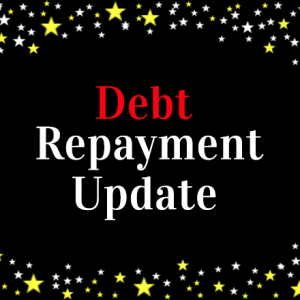 If you read last month’s debt repayment update, you might remember that I was having some trouble with a tricky creditor who wasn’t very understanding about us increasing our monthly payment up to £300 per month. It’s all a bit complicated so if you want to know the full story on that, please feel free to read last month’s post! To cut a long story short, we reached an agreement (for now) where we pay £300 per month to our creditor which is higher than the original loan agreement (as we are still in arrears with them). The hubby and I also decided separately to save any extra money we have so that we can pay lump sums off our last remaining debt when we have enough to make an impact. However, we did manage to save quite a bit this month by earning extra income! Which is just as well, because I had a really bad month in earnings from my regular self employed job (this is exactly what I was trying to explain to our creditor a couple of months ago – that my income fluctuates all the time). I think this is the first time I’ve posted information on my earnings from side hustles as I’ve only been earning a little bit here and there from time to time in the past. Up until now, I thought that reporting on any extra income probably wouldn’t be all that interesting to you. In June though, we made some good progress with earning extra income so I’m excited to tell you all about what we’ve done. I can say that we worked our socks off to earn this much and I doubt we’ll be able to match it next month, but we’ll see! It was the hubby’s idea to try to make some money on the back of the upcoming Tour De France. When he first suggested that we could perhaps earn a little extra income from making bunting, I didn’t think it was to going to be a big earner if I’m honest. You can buy celebration bunting for next to nothing from eBay after all. However, because the Tour De France is a momentous occasion and it’s actually starting off near to where we live in Yorkshire, the hubby had the foresight to see the potential in creating our own product for this historical event. Rather than make the usual triangle flag bunting, his idea was to make ‘jersey’ shaped bunting in the ‘four leaders’ colours. We priced them at £14 each and we were both surprised when they started to sell like hot cakes. So for the last two weeks or so, the hubby and I have been super busy cutting out jersey fabric shapes and sewing them together on the sewing machine. We made around £550 in sales and then after deducting our fees and fabric expenses, we made a profit of £465. Not bad hey? This really was a great opportunity to make some extra money and we’re keeping an eye out for anything else like this which might crop up in the future. June has been a great month for freelance writing. I’ve been able to land a couple more jobs writing for clients and I’ve also been undertaking some blog commenting and social media promotion too. I have been really lucky in that these clients approached me and I wonder if altering my Hire Me page helped at all. Either way, *shameless plug* I’m very keen to take on more work like this so if you’re looking for a regular or one off content writer or someone to help you manage your blog, please get in touch as I’d be happy to help! You can see all the services I can provide on my Hire Me page. I’ve earned a little money from advertising on the blog this month but most of the money earned here has come from my freelance work. My blog is certainly opening doors for me these days and I’m so thankful for that! I’ll write a little more about this in a future post, but I’m working on an eBook right now based on the Emotional Stages of Debt series which I created some time ago. I’m going to be turning this into a product that I can sell on Amazon. So this is something that I will hopefully earn from in the future. Even though we earned a respectable amount of extra income this month, we’ve not been able to save all of it for debt payoff. We had a very large Vets bill for our dog who had to have an operation. It’s nothing serious but our insurance didn’t cover it because it was classed as a routine op. That bill totalled £186! We’ve also had our car tax to contend with and I had to pay my self employed National Insurance contributions. So in the end, we managed to put £480 into savings. That’s not a bad sum to be able to save of course, but we’d have been lost without the extra income we earned this month! July should be better in terms of less bills and let’s hope we can keep up the momentum with savings and earning extra income. How was June for you financially? Glad you’re getting freelance work . I’m a big believer when money making opportunities arises you should go all in before that closes. Great job on getting extra income this month and good luck on the eBook. Thanks Aldo! Hope June was good for you financially! Wow good job with the extra income. You are doing great! Thanks Michelle! You’re my inspiration! Thanks Kayla. 🙂 Exactly and those savings are for debt payoff once we get a decent amount together. It all adds up! Wow great job! If your husband keeps getting amazing money making ideas like that, you’ll be debt free in no time. Keep up the good work. Thanks Nikki! Let’s hope it continues! Congrats on the extra income. I must admit I had to google bunting because I had absolutely no idea what it meant. 🙂 June was a decent month for me overall for earning and spending! Tonya@Budget and the Beach recently posted…Workin’ on Stress-Free Living, & Giveaway! Thanks Tonya! Lol! Bunting must be an English thing. It’s a string of flags that people put up usually outside their homes to join in a celebration of sorts! Glad you had a good June! Hey, progress is progress! I would love to see pictures of your Tour de France bunting! Great job on the extra income!! I would love to see your bunting too. That’s really cool that your husband came up with the idea and that it was so popular!! Great reading about your extra income opportunities, Hayley! That bunting idea was a great one ~ What fantastic profit margin! Nice job Hayley! I’ll admit I had to look up what “bunting” was 🙂 But what a sweet side gig! Alicia @ Financial Diffraction recently posted…Financial Update: June 2014. I love hearing about people’s clever ideas to make a little extra cash. It always inspires me to try out something new to help pay down my debt. Thank you Trina! 🙂 I’m always thinking of ways to make cash – most of them don’t work – but I still keep on trying. Good luck with paying down your own debt! Great work with the side hustles! Love the idea of the Tour de France bunting, such a good idea to think of how to use the opportunity to make some extra cash.